It seems that my post about free translation tests got a little someone a little (or maybe very) angry. When I write a blog post, and when I participate in a debate about translation on social media, I always tend to keep it classy and super professional, never personal. If there is a 1% chance that my comment would look personal, I immediately reconsider it altogether, and sometimes I end up not posting it, just to avoid misconception and misunderstandings. See the thing is, I’m better off without the headache. I mean, I’ve been in this business for half of my life already, I’ve seen it all, and it’s not worth my time because change doesn’t come with a comment. This is why I established this blog. Yesterday, I realized I made 2 mistakes, both being related to giving second chances. So, to rectify the situation, I decided to write this post. That little translator I mentioned earlier left a ridiculously long comment on my post in a Facebook group, using unprofessional words and thinking it’s Okay and cool to do so. This comment is a personal comment with an effort to make it not personal by stating that it is “personal”. The proof? This person is trying hard to establish her own business, but she is an employee. When you are an employee, you cannot take the same risks as a freelancer, and you can never become a business person, until you actually have the guts to leave your job and establish your own full time job as a freelancer. Period. A few months ago, I refused to take a free copywriting test for her (this is where I made the mistake. I shouldn’t have contacted her in the first place because of previous bad encounters. She was right about one thing, though, and that’s first impressions). She couldn’t afford to pay for the test. Frankly, I’m not about the money, I’m about the principle, so I couldn’t care less that I did not take the job because I did not accept to do the test without prior payment. Moral of the story: She said that I lost the project when in fact, she lost the client because I refused to provide her with my service (call it test, call it whatever. It is a service) Sooner or later, this client will resort to me or to another language service provider who will definitely be a real professional. She seems to have gotten so upset about that and she couldn’t let it go. So when I posted about the free test, she baffled me with her long comment. Listen, everyone. Take as many free tests as you like. No one is really standing in your way. When I stated that it is my personal opinion, it is because I have my own BUSINESS. I am not an in-house translator. I run an agency. 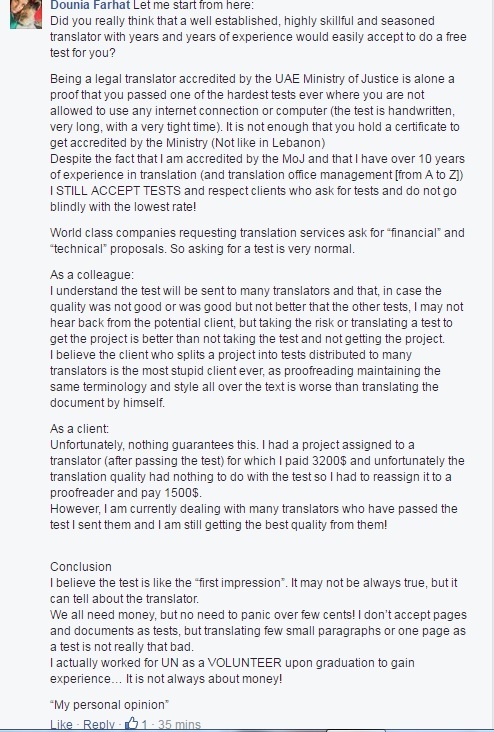 Do you ever see translation companies/agencies doing tests for their clients? Just think about it like that. To those of you who have never been fooled because of a test, Kudos! Really! To those of you who really want to become professional and establish their own business and be their own boss, you really ought to consider the way you talk with people. Attitude can make or break you. You see, my mistake is giving this person a chance 7 years after my first encounter with her. I did not give her the job because of that same attitude. To end this post on a positive note, cheers to all the professional translators who keep it classy and who are a pleasure to work with!